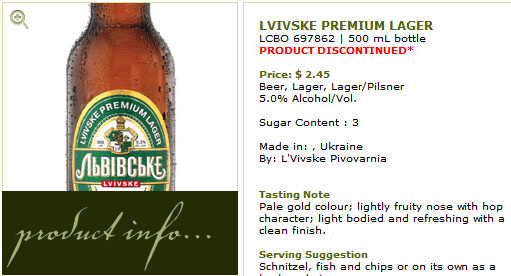 Anyone looking for the Ukrainian Beer ‘Lvivske’ were surprised to see in big letters PRODUCT DISCONTINUED on the LCBO page. A quick search on the LCBO site reveals only a few are left in the province with the majority in Thunder Bay and a few scattered around the GTA. Lvivske and its brother Slavutich, believe it or not, are not independent beers, but are actually owned by the conglomerate Carlsberg which owns many beers internationally. Compare that to a popular independent Ukrainian Beer that is not available in Canada for some reason is Obolon, although you can get this beer in the US. Edit: Lucky people in BC can actually order Obolon to their local liquor stores. Great there goes another good beer. After fiesta week in Oshawa, no more Lvivske beer.Hey why do you discontinue good stuff. I guess we will have to discontinue Vareniky. My dad likes this stuff and I saw him drinking a bottle of it yesterday. So as of December 2011 we have it in Toronto. Will we have some at the September Ukranian Festival in Toronto this year?